Washington's Birthday is a United States federal holiday celebrated on the third Monday of February in honor of George Washington, the first President of the United States, who was born on February 22, 1732. Since the Uniform Federal Holidays Act of 1971, its observance can occur from February 15 to 21, inclusive. Colloquially, the day is also now widely known as Presidents' Day and is often an occasion to honor all who have served as president, not just George Washington. "The third Monday in February" in California; Lincoln's birthday is explicitly named as a separate holiday. George Washington was born on February 11, 1731 (Old Style), at his parents' Pope's Creek Estate near Colonial Beach in Westmoreland County, Virginia. At the time, the entire British Empire, including its North American possessions, was on the Julian calendar; the Empire, not being bound to the Catholic Church, had not yet adopted the modern Gregorian calendar that Catholic countries had adopted in 1582. Consequently, by the 1730s, the Julian calendar used by Britain and the Colonies was eleven days behind the Gregorian, due to leap year differences. Furthermore, the British civil year began on March 25 rather than January 1, so that dates in February (such as this one) 'belonged' to the preceding year. (See Dual dating). In 1752, The British Empire switched to the Gregorian calendar; since then, Americans born prior to 1752, including Washington, have typically had their birthdays recognized under what their birthday would have been under the Gregorian calendar ("New Style" dates). Since, during the 1700s, February 11 under the Julian calendar would fall as February 22 on the Gregorian, Washington's birthday has been generally recognized as February 22, 1732. The first attempt to create a Presidents Day occurred in 1951 when the "President's Day National Committee" was formed by Harold Stonebridge Fischer of Compton, California, who became its National Executive Director for the next two decades. The purpose was not to honor any particular president but to honor the office of the presidency. It was first thought that March 4, the original inauguration day, should be deemed Presidents Day, but the bill recognizing March 4 stalled in the Senate Judiciary Committee (which had authority over federal holidays). The committee felt that, given its proximity to Lincoln's and Washington's Birthdays, three holidays so close together would be unduly burdensome. But meanwhile the governors of a majority of the states issued proclamations declaring March 4 Presidents' Day in their respective jurisdictions. 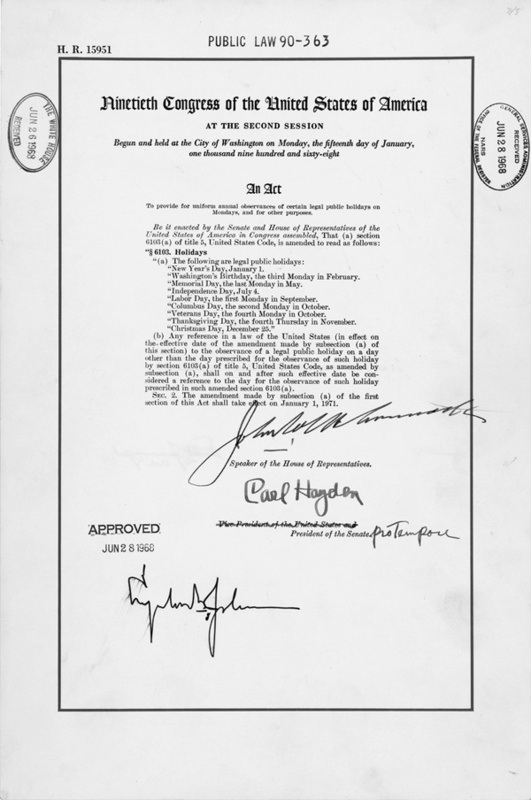 An early draft of the Uniform Monday Holiday Act would have renamed the holiday "Presidents' Day" to honor the birthdays of both Washington and Lincoln, which would explain why the chosen date falls between the two, but this proposal failed in committee, and the bill was voted on and signed into law on June 28, 1968, keeping the name "Washington's Birthday". In Washington's adopted hometown of Alexandria, Virginia, celebrations are held throughout February. A food traditionally associated with the holiday is cherry pie, based on the legendary chopping down of a cherry tree in Washington's youth. Until the late 1980s, corporate businesses generally closed on this day, similar to present corporate practices on Memorial Day or Christmas Day. However, after having been moved to the third Monday, most businesses remain open with many offering sales and other promotions. Federal and state government services close (U.S. Postal Service, state Departments of Motor Vehicles, federal and state courts). Class schedules at universities and colleges vary depending on the school. Public elementary and secondary schools are generally closed, but some school districts, such as New York City, may close for an entire week as a "mid-winter recess". The holiday is also a tribute to the general who created the first military badge of merit for the common soldier. Revived on Washington's 200th birthday in 1932, the Purple Heart medal (which bears Washington's image) is awarded to soldiers who are injured in battle. Community celebrations often display a lengthy heritage. Washington's hometown of Alexandria, Virginia, hosts a month-long tribute, including what is claimed to be the nation's longest-running and largest George Washington Birthday parade, while Eustis, Florida, continues its annual "GeorgeFest" celebration begun in 1902. In Denver, Colorado, there is a society dedicated to observing the day. At the George Washington Birthplace National Monument in Westmoreland County, Virginia, visitors are treated to birthday celebrations on the holiday, while at Mount Vernon, they last throughout the holiday weekend and through February 22. Since 1862 there has been a tradition in the United States Senate that George Washington's Farewell Address be read on his birthday. Citizens asked that this be done in light of the ongoing Civil War. When used with the intention of celebrating more than one individual, the form "Presidents' Day" was usual in the past. In recent years, as the use of attributive nouns (nouns acting as modifiers) has become more widespread, the form "Presidents Day" has become more common; the Associated Press Stylebook, most newspapers and some magazines use this form. "President's Day" as an alternate rendering of "Washington's Birthday", or for the purpose of commemorating the presidency as an institution, is a proper use of a possessive and is the legal spelling in eight states. But it is a misspelling if meant to refer to more than one president (see apostrophe). ^ a b Hertzberg, Hendrik (February 19, 2007). "Too Many Chiefs". The New Yorker. Archived from the original on April 4, 2014. Retrieved February 22, 2017. ^ a b c Strauss, Valerie (February 16, 2014). "Why Presidents' Day Is slightly strange". The Washington Post. Archived from the original on February 18, 2014. Retrieved February 17, 2014. ^ "Presidents' Day". HIP Pocket Change. United States Mint. Archived from the original on February 2, 2014. Retrieved January 21, 2014. ^ See Public holidays in the United States for citations. ^ "Years 2016 and 2017 Holidays to be observed by the Hawaii State Government" (PDF). Hawaii. August 11, 2015. Archived from the original (PDF) on January 25, 2017. Retrieved February 19, 2017. ^ "Holidays". Office of Management and Budget. North Dakota. Archived from the original on February 21, 2017. Retrieved February 20, 2017. ^ "RCW 1.16.050". Revised Code of Washington. Archived from the original on February 3, 2015. ^ "Public Holidays and Recognition Days, §1C,2" (PDF). Iowa Legislature. December 13, 2016. Archived (PDF) from the original on December 22, 2016. Retrieved February 20, 2017. ^ "Massachusetts Legal Holidays". www.sec.state.ma.us. Retrieved February 16, 2019. ^ "Legal Holidays (Excerpt)". Archived from the original on August 28, 2017. Retrieved February 16, 2018. ^ "New York State Holidays" (PDF). NY Office of General Services, Business Services Center. September 15, 2016. Retrieved April 13, 2019. ^ "Colorado Revised Statutes Title 24. Government State § 24-11-101. Legal holidays—effect". FindLaw. February 16, 2017. Archived from the original on February 21, 2017. Retrieved February 20, 2017. ^ "1.14 Excluding first and including last day – legal holidays". LAWriter Ohio Laws and Rules. April 10, 2001. Archived from the original on February 19, 2017. Retrieved February 20, 2017. ^ "Washington and Lincoln Day in Utah, per state code". February 13, 2015. Archived from the original on December 20, 2016. ^ "2016 Minnesota Statutes". Revisor of Statutes. Archived from the original on November 24, 2016. Retrieved February 20, 2017. ^ "2017 Holiday Schedule". State of Alabama. February 2017. Archived from the original on February 5, 2017. Retrieved February 20, 2017. ^ "Cal. Gov. Code §". Archived from the original on October 9, 2016. Retrieved February 12, 2016. ^ "California State Education Code – Washington Day". Archived from the original on July 10, 2015. Retrieved February 12, 2016. ^ "Official State Holidays". New Mexico State Treasurer's Office. Archived from the original on November 7, 2011. Retrieved January 21, 2014. ^ "Observing State Holidays". Georgia. August 5, 2016. Archived from the original on February 26, 2017. Retrieved February 20, 2017. ^ "SPD: State Holidays". Indiana State Personnel Department. Archived from the original on March 1, 2016. Retrieved February 14, 2016. ^ Engber, Daniel (January 18, 2006). "What's Benjamin Franklin's Birthday?". Slate. Archived from the original on July 28, 2011. Retrieved May 21, 2011. ^ Washington was born on February 11, 1731, based on the Julian calendar then in use in the British Colonies. When the Gregorian calendar was adopted in the English Colonies (1752), he opted to begin observing his birthday anniversary on the equivalent date of February 22, 1732. ^ "Uniform Monday Holiday Act". National Archives and Records Administration. January 15, 1968. Archived from the original on May 21, 2011. Retrieved February 15, 2011. ^ a b Hannaford, Peter (February 17, 2012). "The Day That Isn't". The American Spectator. Archived from the original on February 18, 2018. Retrieved February 17, 2018. ^ Arbelbide, C.L. (Winter 2004). 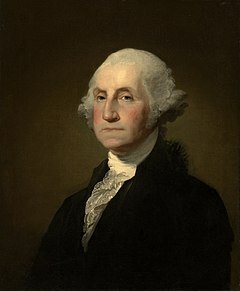 "By George, It Is Washington's Birthday!". Prologue Magazine. Archived from the original on February 19, 2009. Retrieved February 13, 2009. ^ Mirabile Jr., Jasper J. (February 16, 2014). "Celebrate George Washington's birthday with cherry pie". The Kansas City Star. Archived from the original on November 5, 2016. Retrieved February 17, 2018. ^ Glass, Andrew (February 20, 2017). "Presidents Day is being observed today, Feb. 20, 2017". Politico. Archived from the original on March 1, 2017. Retrieved February 17, 2018. ^ May, Ashley (February 15, 2018). "What is open and closed on Presidents Day?". USA Today. Archived from the original on February 15, 2018. Retrieved February 17, 2018. ^ "2017–2018 Holidays and Key Dates". New York City Department of Education. Archived from the original on October 9, 2017. Retrieved February 18, 2018. ^ Miller, T. Christian (September 8, 2010). "A History of the Purple Heart". National Public Radio. Archived from the original on July 20, 2017. Retrieved February 18, 2018. ^ "Parade". George Washington Birthday Celebration. Archived from the original on September 5, 2017. Retrieved February 18, 2018. ^ "Celebrating 113 Years of GeorgeFest". Lake County News. Archived from the original on March 18, 2015. Retrieved February 28, 2015. ^ "The Charter". Presidents Day Society. Archived from the original on July 13, 2012. Retrieved January 21, 2014. ^ "George Washington Birthplace Birthday Celebration". Find Your Chesapeake. Archived from the original on February 18, 2018. Retrieved February 18, 2018. ^ "Washington's Birthday Celebration". George Washington's Mount Vernon. Archived from the original on July 9, 2017. Retrieved February 18, 2018. ^ "Washington's Farewell Address". United States Senate. Archived from the original on December 6, 2017. Retrieved February 18, 2018. ^ Nelson, Pam (March 23, 2006). "Kids Day or Kids' Day". Grammar Guide. The News & Observer. Raleigh, NC. Archived from the original on March 19, 2009. ^ Office of the Press Secretary (February 19, 2007). "President Bush Visits Mount Vernon, Honors President Washington's 275th Birthday on President's Day" (Press release). The White House. Archived from the original on May 7, 2013. Retrieved January 21, 2014.